Ever since I first saw Wes Anderson’s The Life Aquatic with Steve Zissou, which starred Bill Murray as an oceanographer / film documentarian based on real-life adventurer Jacques Cousteau, I’ve wanted to check out one of Cousteau’s films. If nothing else, I wanted to see if they looked anything like the mock documentaries Anderson created for his movie (in The Life Aquatic, Zissou is trying to raise money to finish his opus on the Tiger Shark, a never-before-seen creature that killed his mentor and best friend), which I found strangely appealing. Well, after watching 1982’s Calypso Countdown: Rigging for the Amazon, I’m happy to report that, while Anderson’s take on a Jacques Cousteau film was far quirkier than the real deal, he did remain loyal to the spirit of the movies that inspired him. 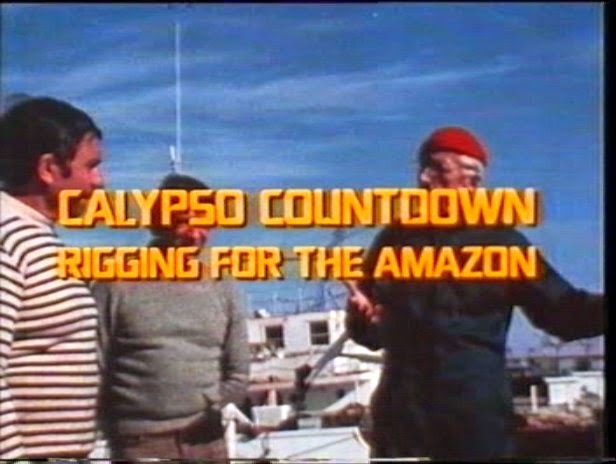 Released as the first part of a seven-episode television series, Calypso Countdown Rigging for the Amazon (narrated by Joseph Campanella) has Cousteau and his team preparing for an extended trip up the Amazon River, a journey that would last almost two years. Yet, while the film did teach me a little something about the Amazon (I was surprised to learn the river houses more species of fish than the entire Atlantic Ocean), and featured footage of Cousteau and his associates getting ready for their long journey, the bulk of this movie was dedicated to the history of the Calypso, a former World War II British minesweeper that Cousteau transformed into a science vessel (the movie also features John Denver’s 1975 song, Calypso, which he wrote in honor of the ship). So, even though I didn’t get to see much along the lines of a “Cousteau Adventure”, Calypso Countdown: Rigging for the Amazon was, at the very least, a great introduction to the famed oceanographers work.